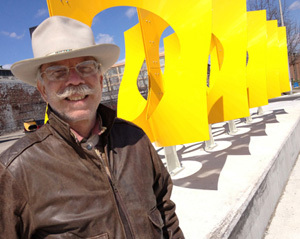 Welcome to Hudson Sculpture, LTD.
Jon Barlow Hudson creates public sculpture, private sculpture installations and corporate sculpture environments world-wide. 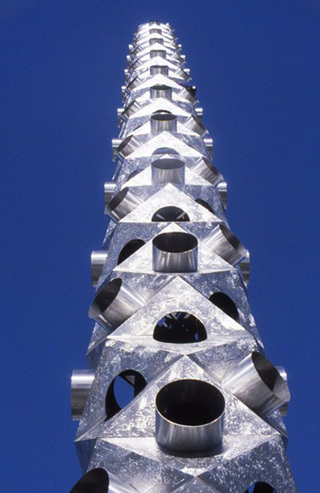 An example of such large-scale sculpture projects is the 100 foot high, stainless steel PARADIGM, pictured here, one of two architectural-scale sculptures constructed for the World Expo '88 at Brisbane, Australia. As you may see on the interactive World Map noted above, Hudson has installed public sculpture projects in 23 different countries around the world. Jon Barlow is particularly sensitive to designing for compatibility with the architectural context, environmental ambience and thematic requirements of the sculpture project, resulting in unique sculptures that transform their situation. Jon Hudson creates sculpture in a wide variety of materials such as: granite, marble, stainless steel, bronze, steel, wood, color, water, light, fiber optics, various types of glass and natural elements. Types of sculpture installation, most of which are created site-specific, include: exterior sculpture, interior sculpture, atrium sculpture, suspended sculpture installations, wall-mounted sculpture, environmental sculpture and sculpture fountains. Hudson is experienced in collaboration with other relevant professions in the sculpture construction process and values such opportunities. Jon welcomes your inquiry and appreciates your visit.